In October, Eaton Miami Valley Career Technical Center (MVCTC) FFA member Trent Broermann was selected as one of the top four Supervised Agriculture Experiences in the nation. Above Trent is pictured with his parents Mike and Lisa Broermann. EATON — Eaton Miami Valley Career Technical Center (MVCTC) FFA member Trent Broermann was chosen in August as one of the top four proficiency finalists in the area of Forage Crop Production. 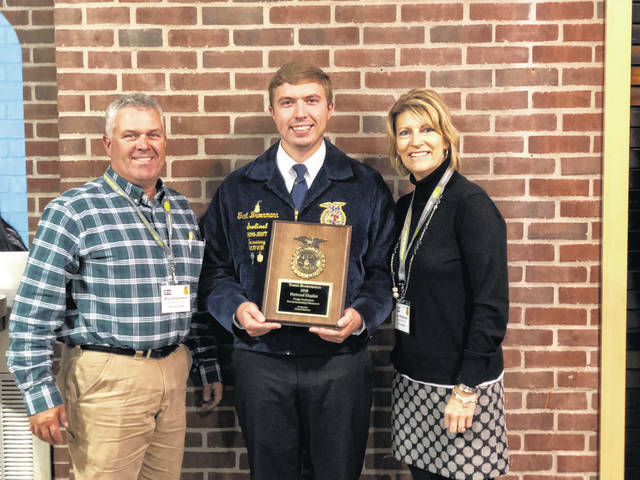 After winning the Ohio FFA State Forage Crop proficiency in May, his application was forwarded to the National FFA and selected as one of the top four Supervised Agriculture Experiences in the nation. On Oct. 25, he went through several hours of interviews and was awarded a finalist plaque and $500 on stage during the National FFA Convention in Indianapolis, Indiana. Broermann loves to work on the family farm. Over the past three years he has made thousands of round and square bales of hay and straw. Broermann worked diligently keeping records and documenting his experiences. He is one of many Eaton MVCTC FFA members forging their way and setting the Gold Standard. https://www.registerherald.com/wp-content/uploads/sites/41/2019/01/web1_trent-award-picture.jpgIn October, Eaton Miami Valley Career Technical Center (MVCTC) FFA member Trent Broermann was selected as one of the top four Supervised Agriculture Experiences in the nation. Above Trent is pictured with his parents Mike and Lisa Broermann.